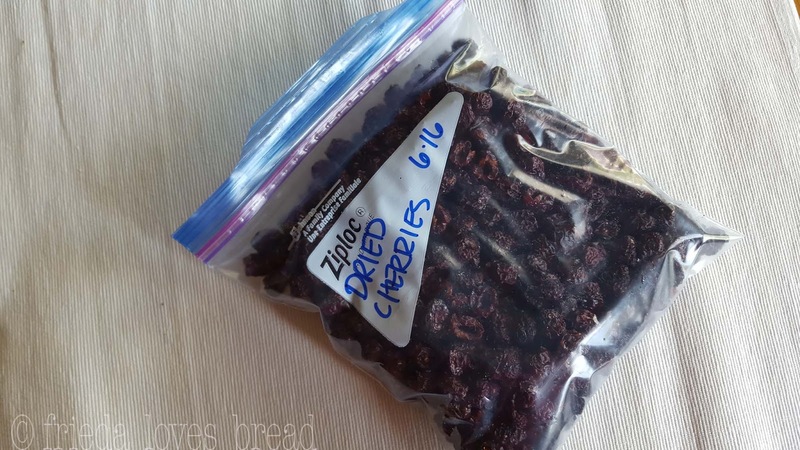 Frieda Loves Bread: Oven Dried Cherries & Bonus Simple Syrup! 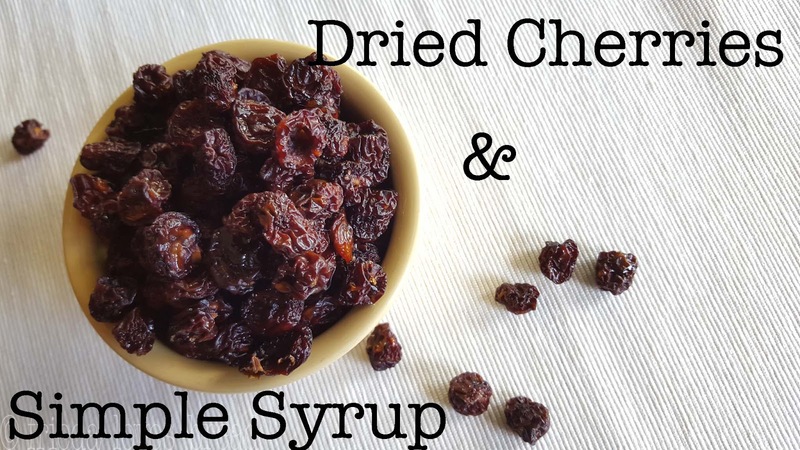 0 Oven Dried Cherries & Bonus Simple Syrup! I had a bumper crop of cherries this year! After enjoying several handfuls of fresh cherries and making a couple of Fresh Cherry Cobblers, making a syrup for Cherry Lime Ricky's, I needed some ways to preserve the rest of the cherries. Freezing: I took half of the cherries, washed, pitted, and froze them on a plastic wrapped cookie sheet in a single layer. After freezing, I put them into freezer Ziploc bags. These cherries will be used for smoothies, cobblers, and other desserts. Drying: I took the other half and tried my hand at drying them. 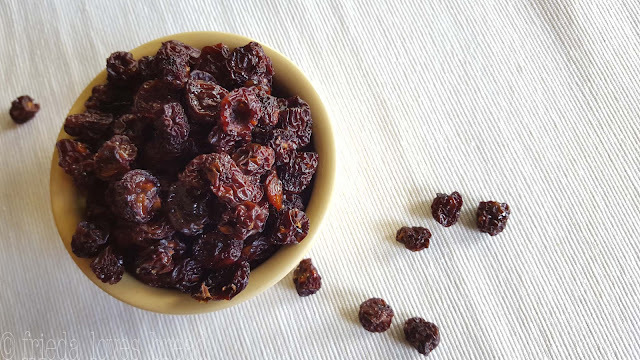 Dried cherries are amazing tossed into a salad, homemade yogurt, in your morning cereal, or in a homemade granola. I don't have a dehydrator, but I do have a convection oven with a dehydrating setting. 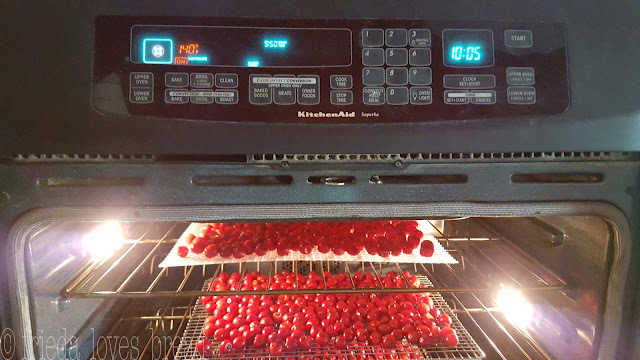 If your oven temp starts at 200°F, you can try drying your cherries at this temp. This method not only dries your cherries, but you can get a simple syrup as well! Use your syrup in your favorite cocktail drink, Coke, lemonade, Lime Ricky, spritzer, salad dressing, or sweetener for iced tea. One pound of cherries will give you about 1/2 cup of syrup. First, pit your cherries. I love using Progressive's cherry pitter, to do 4 cherries at a time. There are about 25% of the cherries that still have pits attached, but are easily removed. Next, weigh your cherries. I like to cover my OXO Good Grips digital scale with a plastic bag for easy clean up. I love that you can pull out the display if you are using a large bowl and that it lights up. I am using Rubbermaid's 6 qt clear square food storage container to weigh and store in the fridge. Toss in 5-10% sugar. 5% of 6 pounds is .3 pounds. 1 pound of granulated sugar is 2 cups. 1/3 pound of sugar is about .6 cups, so I put in a heaping 1/2 cup of sugar into the cherries and gave it a good stir. Cover, and place in the fridge overnight, in a non-reactive (plastic or glass bowl). Next day, strain your cherries and reserve the simple syrup. Lightly oil a wire cooling rack or dehydrating sheets. I found the plastic sheets at a sporting goods store. I believe they are for smoking jerky, which worked very well for drying cherries. Spread the cherries into a single layer. Dry at 135°-140° for 12-24 hours until they are dry. Bag, date and freeze. I can't believe how compact 6 pounds of cherries fit into this bag! 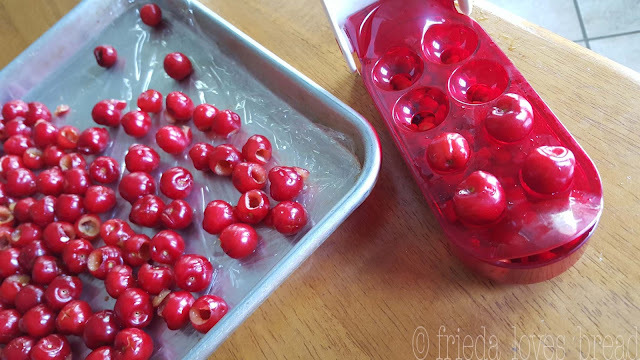 Give this method of drying your cherries a try. You'll love the versatility of using dried cherries in many of your recipes and enjoy the bonus simple syrup! Use a dehydrator or convection oven with a low heat setting to dry out sweet cherries that take a fraction of the space to freeze or preserve. 1. Wash and pit your cherries. 2. Weigh the cherries.3. 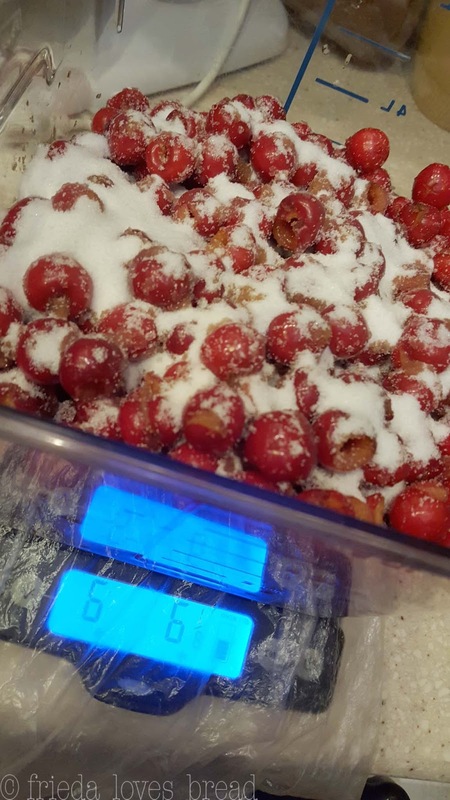 In a large food safe glass or plastic container, toss in 5-10% (of the weight of cherries) granulated sugar into the cherries. Stir well. 1/2 pound of sugar = 1 cup. For example: 6 pounds of cherries=1/3 pound=.6 cups of sugar. 4. Cover the sugar coated cherries and place the fridge over night. 5. Next day, strain your cherries and reserve the simple syrup. 6. 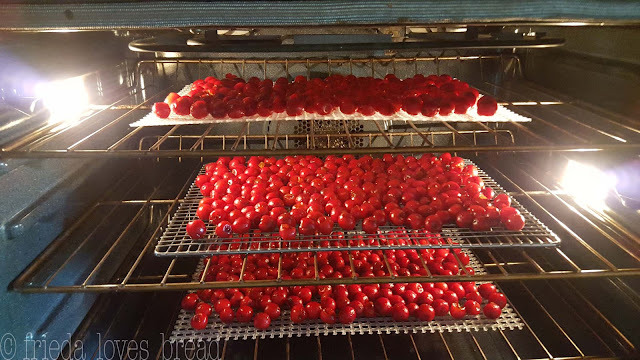 Lightly oil a wire cooling rack or dehydrating sheets.Place cherries in a single layer.7. Set oven or dehydrator at 135°F-140°F for 12 - 24 hours or until they are dry. Bag, date, and freeze.